The U.P. 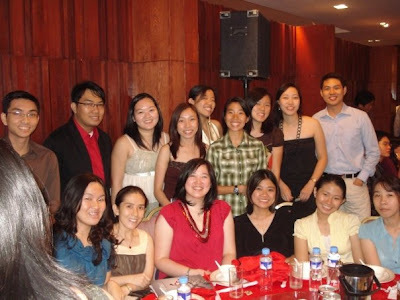 Chinese Student Association Alumni Homecoming held last Jan. 31st in Gloria Maris, Greenhills. First time that a lot of people attended, most of them I do not know anymore... batches way ahead or younger peeps. Anyway, here's a pic of some people I used to hang out in the tambayan. Dr. Mike Te and Arch. Charles Ng not in pic but present. Ooh tambayan, I miss you! Won a bag of first aid kit and also brought home a UP CSA mug and car sticker.